Ice-themed slots appear to be all the rage nowadays, perhaps it has something to do with the current season as of the writing of this review, or maybe, just maybe, the Disney movie Frozen has let go of any fears of having these sorts of slots be anything less than successful. 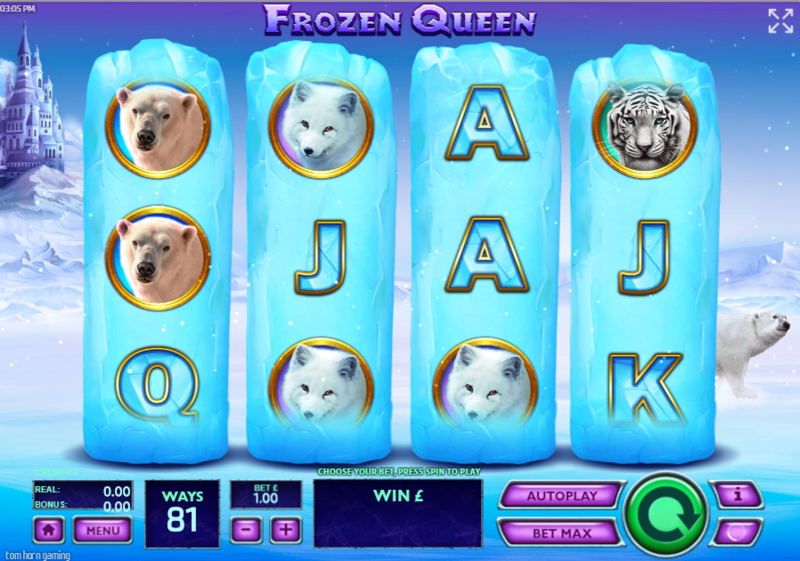 Frozen Queen comes to you from developer Tom Horn Gaming, and comes with 4 reels that promote around 81 unique ways of coming out on top with every single spin that you partake in. Symbols here fit within the winter aesthetic also, represented via bears and other arctic creatures. If you are clambering for more info, then why not check out the rest of the review below? Expanding Wilds: On top of your very basic wild symbol, you also have the expanding wilds, these symbols will take up entire rows, making it very simple for you to add match and ultimately win these symbols outright. The Queen: Should you find the queen symbol on the reels, then you will find that this 4 reel game turns into a 5 reel one which means that the amount in which you can win will also increase to around 243. This feature can only be activated once per spin, but is a great way of adding to your victories. Don't forget to check out more of our UK bonus slots promos and extras! Frozen Queen is a very well-crafted slot, one that you can easily master within only a handful of spins if you do so desire. The icy gameplay elements coupled with the piercing visuals, do a great job in encouraging you to keep spinning for hours on end. Be sure to check out this slot when you get the chance if you haven’t done so already, it’s incredible! If you enjoyed Frozen Queen why not try another Easy Slot?